Nothing is quicker, easier or more delicious than these Korean BBQ Kabobs. Choose your favorite meat & veggies, marinate them, then grill to perfection! Dinner in 30! In a small bowl, whisk all marinade ingredients together. Set aside. Using 2 gallon-sized ziploc bags, place pork in 1 bag and vegetables in the other. Pour 1/3 of marinade over pork and the remaining 2/3rds over the vegetables. Let marinate in refrigerator for at least 20-30 minutes. If using wooden skewers, place in pan of water while meat and vegetables marinate to prevent them from burning during grilling. Heat grill while you are assembling kabobs. Remove meat & vegetables from ziploc bags and discard marinade. 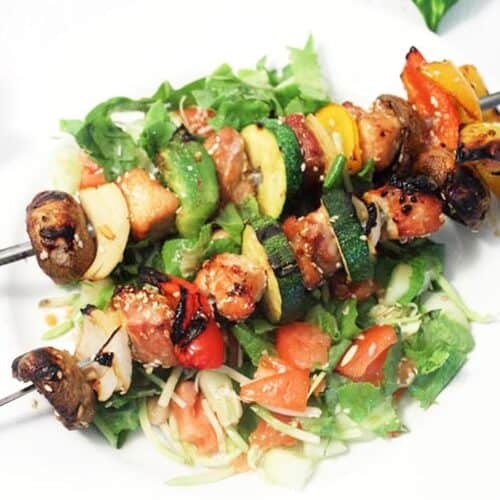 Alternately skewer meat and veggies on skewers. Place on hot grill and cook 3-4 minutes per side. Serve with sides or over the top of a tossed salad.